YouTube’s Promoted Videos recently passed the 1 billion mark in the number of video views delivered to advertisers. Promoted Videos allows any advertiser to promote a video against search results on YouTube or against related videos on YouTube or content across the Google Display Network. Search engine marketers already skilled with Google AdWords have used YouTube Promoted Videos to increase brand awareness and drive sales. We would also like to highlight a few changes to the product. Placement on Google Video search results. We are expanding Promoted Video ads to show up on the Google.com Video search results page in the US only. This change gives advertisers more opportunity to connect with potential viewers when they are actively seeking out video content. If you have search ads set up in your account, we will serve either your Promoted Video ad or your Google AdWords search ad, not both, based on a range of factors including your bid and quality score. To make sure you can take advantage of this increase in your clients’ potential audience, please opt into “Search partners” in your campaign. 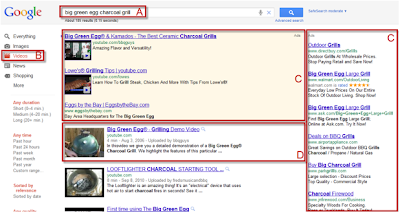 When you enter your search terms (A) on video.google.com (B), you’ll see your Promoted Video ad above or to the right (C) of your organic search result (D). Introduction on YouTube Mobile. In the next few weeks, we will allow your Promoted Video ads to show up on our mobile destination, m.youtube.com, which can be easily viewed by web browser across any mobile and tablet devices. New Google AdWords campaigns are opted into “All devices” by default, but you can opt your ads out of showing on mobile devices if you wish. For existing campaigns, you may wish to verify your devices settings to include/exclude mobile placements. 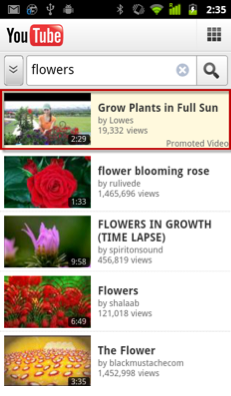 The mobile Promoted Video ad on m.youtube.com will include your ad thumbnail, title and channel name, similar to the organic video results. Inclusion in TrueView video ads. We recently moved Promoted Videos from a cost-per-click ad format to cost-per-view, focusing on the value of video views. In the coming months, Promoted Videos will join our TrueView family of ad formats which provide viewers with choice and advertisers with engaged, opted-in views. Stay tuned for more updates! We hope these changes give you more and better resources to grow your business with online video ads.